The Auburn University College of Veterinary Medicine Class of 2019 joined fellow veterinary students with the start of fall classes on Monday, Aug. 10, one week ahead of students on Auburn’s main campus. 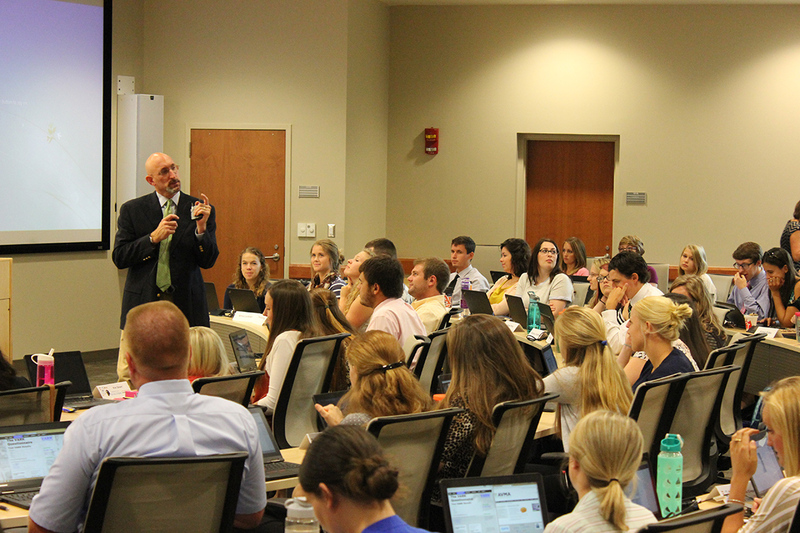 Dr. Dan Givens speaks to first-year students. The 120-member first-year class is majority women, which is the national trend in veterinary medicine, and includes 91 women, and 29 men. The class has 41 Alabama residents and 38 Kentucky residents, through a longstanding cooperative agreement with the Southern Regional Education Board and the Commonwealth of Kentucky. The remaining one-third of the class are from around the U.S: California, 2; Florida, 8; Georgia, 4; Illinois, 1; Massachusetts, 2; Mississippi, 2; North Carolina, 4; New Jersey, 1; New York, 2; Ohio, 1; Pennsylvania, 1; South Carolina, 1; Tennessee, 5; Texas, 4; and Virginia, 3. Prior to beginning classes, the first-year class went through a week of orientation, learning about the college, meeting faculty and making friends with classmates. The orientation included an introduction of academic standards, college policies and curriculum guidelines; and overview of the college’s departments, clinics and programs; discussions with faculty on issues related to evidence-based medicine, public health issues, communications, research opportunities and transitioning to the college. In addition, students had time to bond as they participated in team-building exercises, as well as learn about Auburn traditions. Orientation started with a welcome by college administrators, followed by a luncheon for students and their family and tours of the college’s facilities. 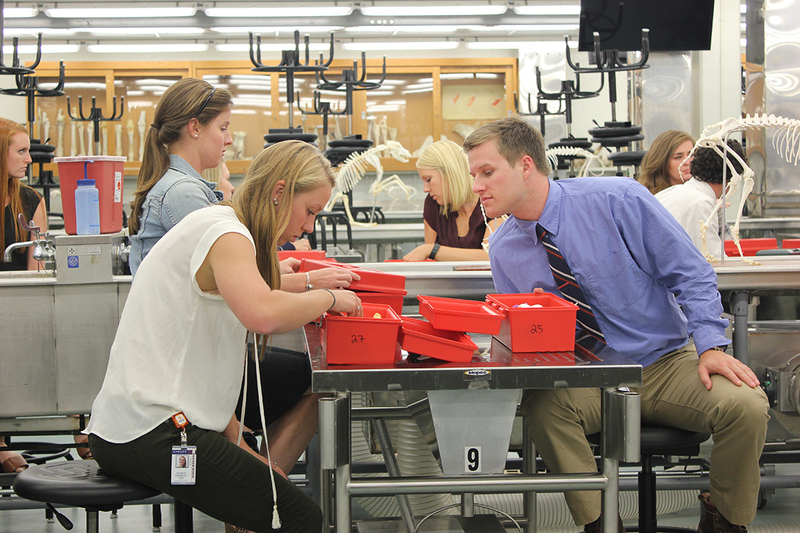 First-year veterinary students open bone boxes. During orientation, students received top-of-the-line technology as well as a time-honored tradition. They became accustomed to using new tablet computers, an integral part of the college’s delivery of educational resources, as well as a bone box which is a time-honored tradition occurring at Auburn’s College of Veterinary Medicine since 1893. When Charles Allen Cary, the first dean of Auburn veterinary medicine, agreed to teach at Auburn in January 1893, he provided a list of items that would be necessary for his employment to Auburn President William L. Broun. Among the items on that list were several complete skeletons of different species so that students could adequately learn the structure and function of the skeletal systems to recognize health and diagnose disease.